The space shuttle's mammoth external fuel tank wound through city neighborhoods on its 16.5-mile journey to the California Science Center. The space shuttle's 33-ton external fuel tank dwarfs everything around it as it passed through Westchester on its journey to the California Science Center. SCE crews work on Lincoln Boulevard in Marina del Rey where power lines and telecommunications lines had to be moved to make way for the space shuttle's external fuel tank. SCE crews watch as the space shuttle fuel tank lumbers along Lincoln Boulevard before making a tight turn at Mindanao Way. Utility crews built a wooden ramp so the space shuttle's external fuel tank could safely drive over telecommunications lines in Marina del Rey without damaging them. SCE crews stand by as the space shuttle's external fuel tank passes beneath a de-energized 220-kilovolt power line in Inglewood. The space shuttle's external fuel tank lit up Lincoln Boulevard in Marina del Rey as it made its midnight passage to the California Science Center. A major effort by SCE crews to safely move power and telecommunications lines along city streets helped the fuel tank reach its new home while still keeping customers’ lights on. It was just after 3 a.m. in Marina del Rey and the 154-foot-long space shuttle external fuel tank had successfully negotiated its second tight turn on Lincoln Boulevard and rolled off into the darkness toward the Marina Freeway. 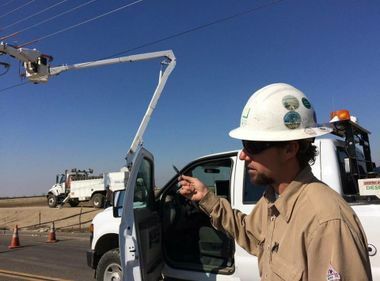 Although the intricate ballet of Southern California Edison crews moving electrical and telecommunications lines to make way for the 33-ton fuel tank went off without a hitch, Jesus Enriquez, the SCE manager overseeing transmission’s part of the project, was worried. “It’s an hour behind,” said Enriquez, who knew the potential pitfalls having worked on Space Shuttle Endeavour’s move four years ago. 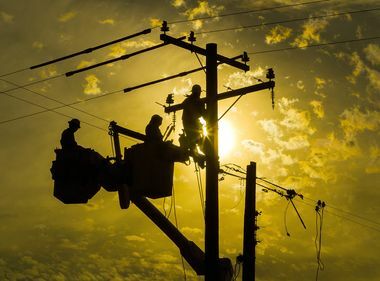 The good news was that the months of SCE advanced planning to safely move lines and reroute circuits without interrupting power to customers had worked. SCE crews clear the way for the space shuttle external fuel tank's historic trip. But for Enriquez, the looming concern was the two 220-kilovolt transmission lines on the route in Inglewood, about seven miles away. The lines are controlled by the California Independent System Operator and SCE had a specific window of time scheduled to do the work on Arbor Vitae Street for the fuel tank to pass. The fuel tank, sometimes crawling inches at a time on the 16½-mile route, needed to be on time. They had about six hours. But while Enriquez was fretting, the public was celebrating. The massive fuel tank, dubbed ET-94, is the last one NASA certified for flight to support a shuttle mission. After Space Shuttle Columbia disintegrated while returning to earth in 2003, ET-94 was mothballed. Now it was coming to a new home at the California Science Center in Exposition Park where it will be paired with Space Shuttle Endeavour, which made its own laborious trip through city streets in 2012. Thousands of people, some stepping out of their front doors, others coming from out of town, lined the route to see the fuel tank make its historic journey. James, 10, stood grasping an inflated replica of a space shuttle and fuel tank that had been hanging from his bedroom ceiling. He could hardly contain his excitement, noting he saw the Endeavour’s trip. As the hours passed and night turned to day, the fuel tank was able to make up for lost time. 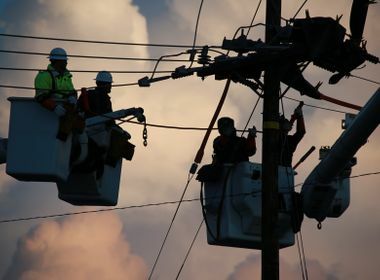 In Inglewood, SCE crews made preparations for the 220-kV lines. Initially, they measured the lines with a laser to ensure there was enough height clearance for the fuel tank, which towered 3½ stories even laying on its side. Just to be sure, they went old school going up in a bucket and dropping a tape measure to the street. It measured 52 feet, enough for the fuel tank to pass without having to raise the line. Shortly after 8 a.m., Enriquez messaged Judi Grissmeyer, SCE’s project manager, that they were good to go. Meanwhile, the fuel tank arrived on schedule, moving under the first de-energized 220-kV line and then later the second, just as planned. Enriquez could finally relax and reflect on the moment. He said he never dreamed as a young boy growing up in Inglewood that he would become an SCE engineer involved in not one, but two major space shuttle events. “It is so great to be part of shuttle history,” he said.